Today my friend Jordan invited me and another friend to go hiking on the trail to the natural water slides. I’ve only ever been on this trail in summertime and Jordan thought it would be pretty all frozen over. 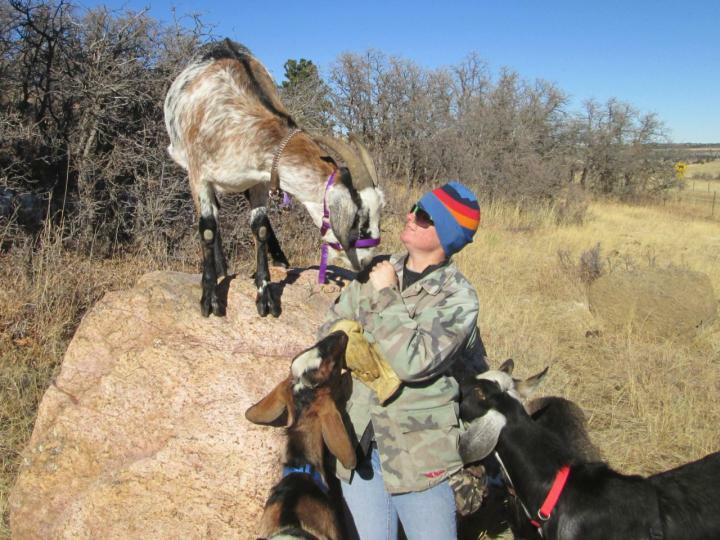 She brought her yearling packgoat-in-training, Geronimo, and I brought Sputnik. We put the little blue pack on Geronimo and he carried a few odds and ends. 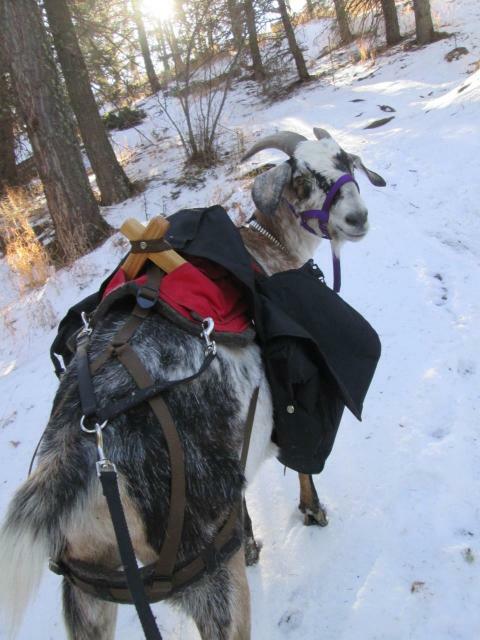 Sputnik carried the crossbuck saddle with a set of horse saddlebags tied on (the normal panniers were overkill). He carried the water bottles, some snacks, and a bit of litter we found along the way. It was a really fun hike and Sputnik was great. He was a little pushy at first because he didn’t have Finn there to keep him at the back of the line, but after getting corrected a couple of times for shoving past people, he settled down and stayed out of everyone’s way. Geronimo was a funny little dude. 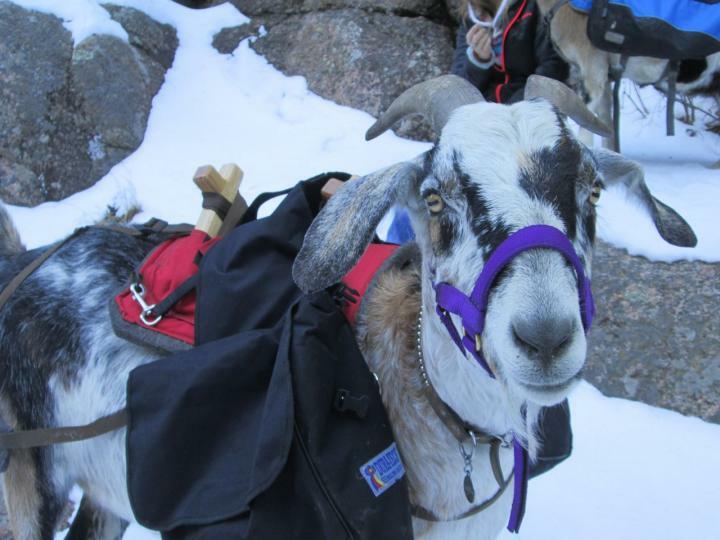 Jordan has been off at college most of his life so he hasn’t been handled as much as most packgoats his age, but he’s a very chill goat and wasn’t too skittish about wearing a halter and pack. He loved climbing over all the rocks. but he never got out of sight of Sputnik, who was a very good mentor for the little guy. 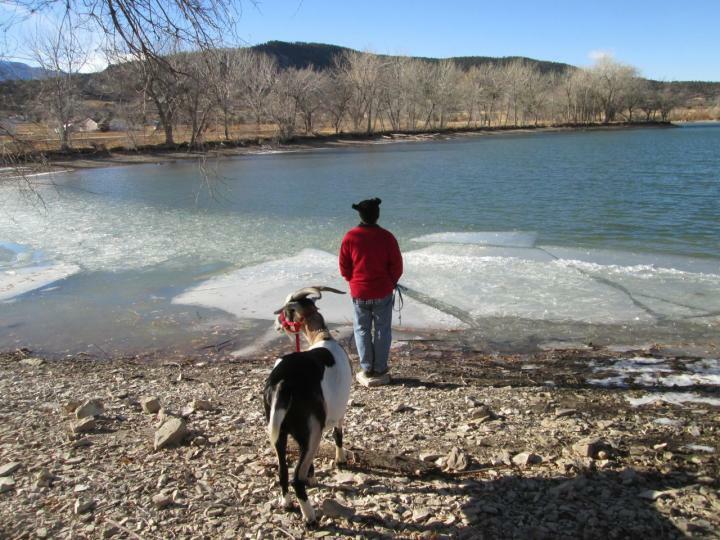 Sputnik showed Geronimo how to cross shallow water without a fuss, but Geronimo wasn’t convinced and twice tried to cross the ice instead. Both times he fell through and got wetter than he would have if he’d just followed Sputnik through the shallow bits along the edge. The creek under the ice was not deep or dangerous, but I’m sure it was cold on the legs! At one point Geronimo got too far away on the wrong side of the creek. 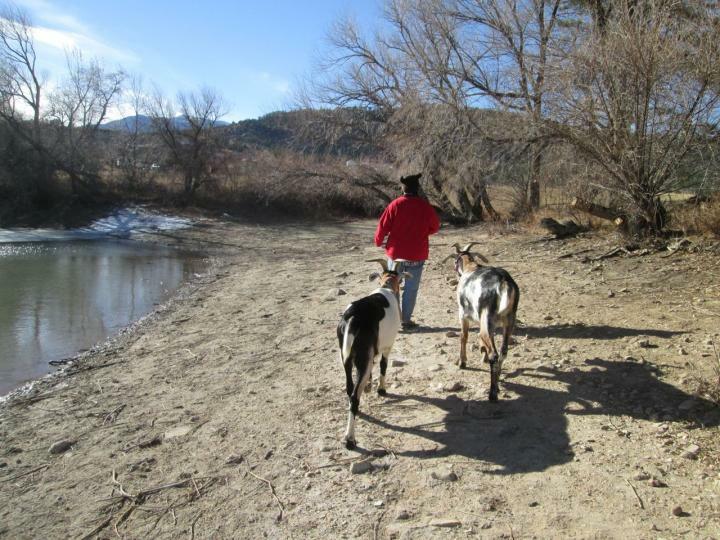 Sputnik was following close behind me when suddenly he turned off the trail, walked to the edge of the creek, and called across to Geronimo. Sputnik waited until Geronimo came after us before he started again. 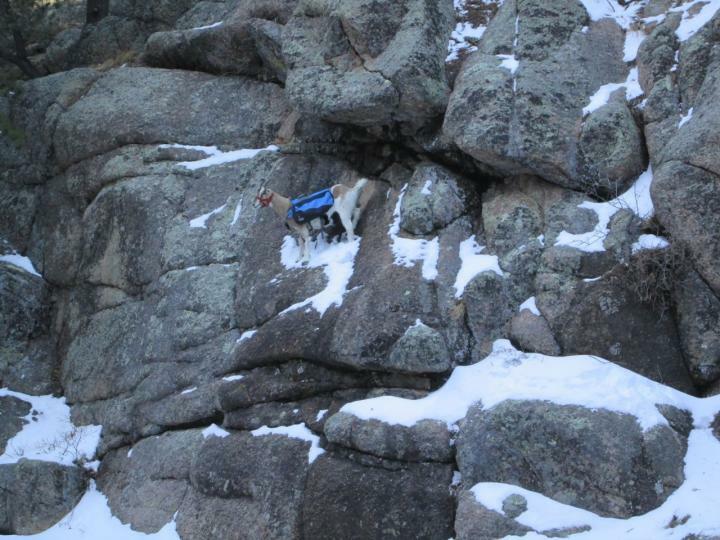 It’s cool that he was looking out for our trail companion! Geronimo challenged Sputnik a few times, which was quite comical. They looked like David and Goliath. Sputnik put Geronimo firmly in his place but he was not mean to him. He never hit Geronimo unless he was provoked, and he didn’t hit hard–only enough to make his point. Today Sputnik had his first test of finding an alternate route for himself. 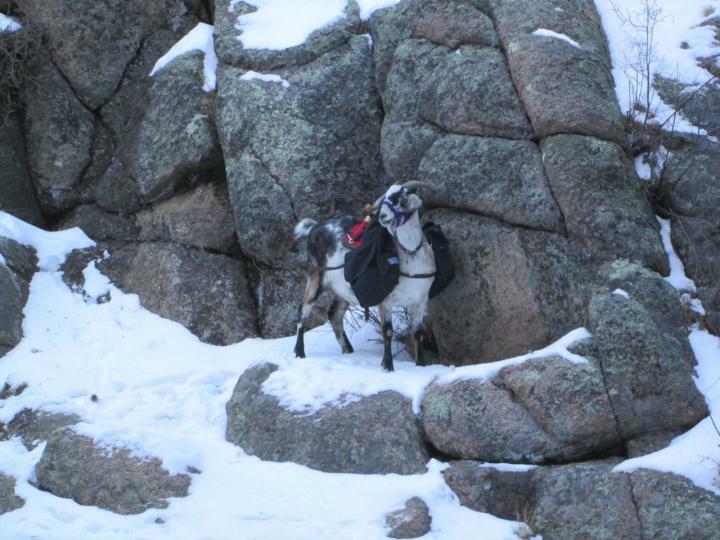 We spent much of the hike scrambling over and around boulders, and at one point the gap was much too narrow for Sputnik’s pack. On the way up I removed the pack so he could squeeze through, but on the way back I wanted to see if he could figure out how to scramble up and over the boulders. The alternate route was no picnic and was also not very obvious, but I knew he could do it if he thought it through. 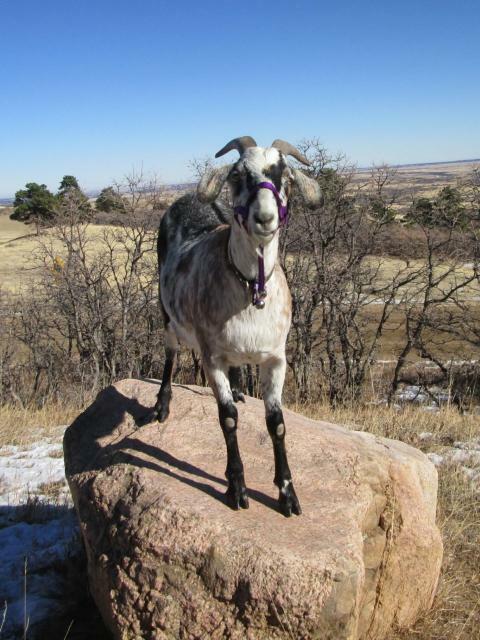 It took him a few minutes, and I heard some very distressed cries from the other side of the rocks before Sputnik’s head appeared over the top of the boulders. From there he had a few tricky leaps and bounds to get down to us, but he made it without incident. I think next time he’ll figure out quicker that he doesn’t have to follow exactly in our footsteps if the people route doesn’t work. Several spots on the trail were steep and icy. Luckily I remembered to attach a strap to the rings on the back of Sputnik’s saddle which could be used as a handle. It came in handy several times. 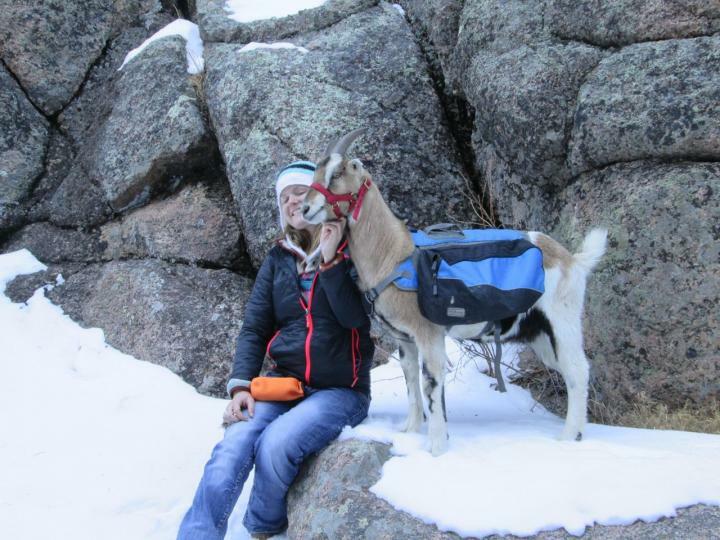 On the last steep, slippery slope I hooked a leash to my strap and I held on while Sputnik pulled me up the hill. He did a magnificent job. In fact, we went up a lot faster than I wanted and I was fairly out of breath after Sputnik made us run most of the way! That driving has really paid off. I was able to have him “whoa” in front of me while I hooked the leash on. Then as soon as I said “walk on” he headed right on up the hill ahead of me. 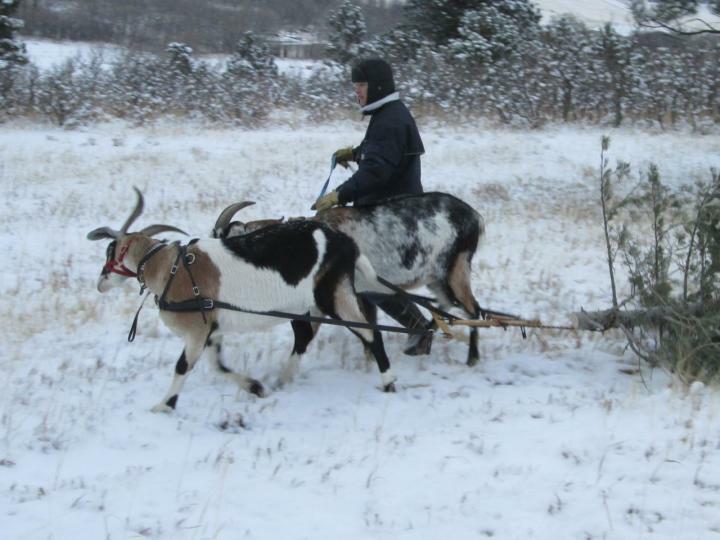 At one particularly steep spot, Sputnik had me hanging onto his saddle and the two other girls holding onto the tow strap! He wasn’t pulling us up, but he was helping us all balance which was kind of messing with his balance. He got a little balky at the end and turned to look at us like “What the heck do you think I am? A ski lift? ?” Needless to say, he got lots of praise and cookies. Thanks to Sputnik, no one got stuck or slid backwards down any hills. He took very good care of us and of Geronimo. What a good boy! I got the cutest, most adorably awesome Christmas gift yesterday!! 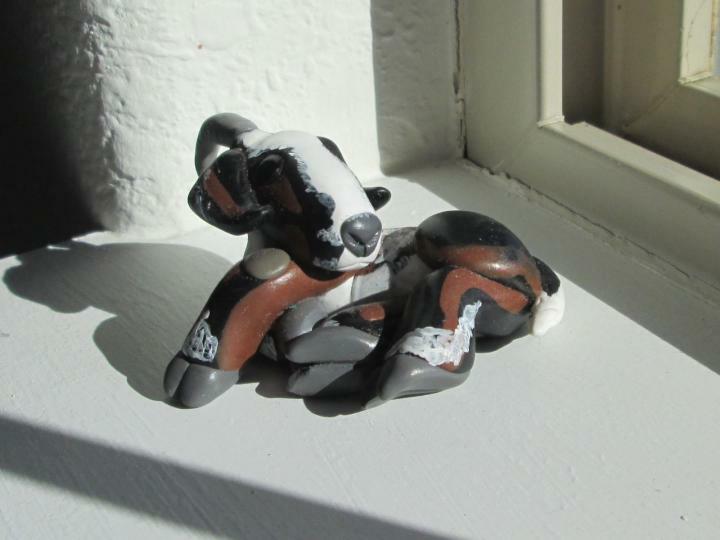 A friend of mine commissioned this little figurine of Cuzco and it’s just like a cartoon of him!! I’m going to treasure this gift for always. In other news, my last post about Cuzco was a bit ominous, but I’m happy to report that the old fellow rallied when the cold weather started and he’s doing just grand. We’ve had a very mild (if windy) winter, but even on the nights when it’s gotten very cold Cuzco has done very well. He’s still King of the hay feeder and Finn remains very subdued in Cuzco’s presence. If Cuzco moves to one side of the feeder, Finn runs to the other. As long as Cuzco feels good enough to pound Finn into submission I figure he’s doing just fine. 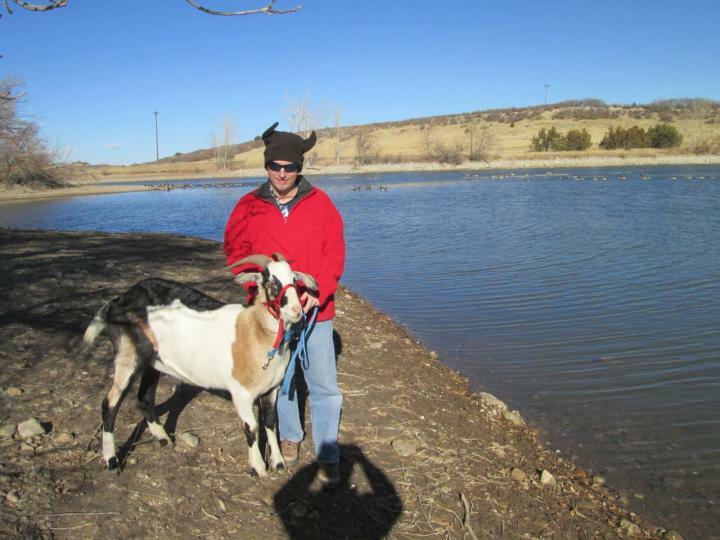 Phil and I took Finn and Sputnik for walk around Cuzco’s old stomping grounds at Lake Beckwith this afternoon. The boys had a fun time, and Sputnik has gotten to where he is pretty eager about running over and hopping in the truck when it’s time to go for an outing. 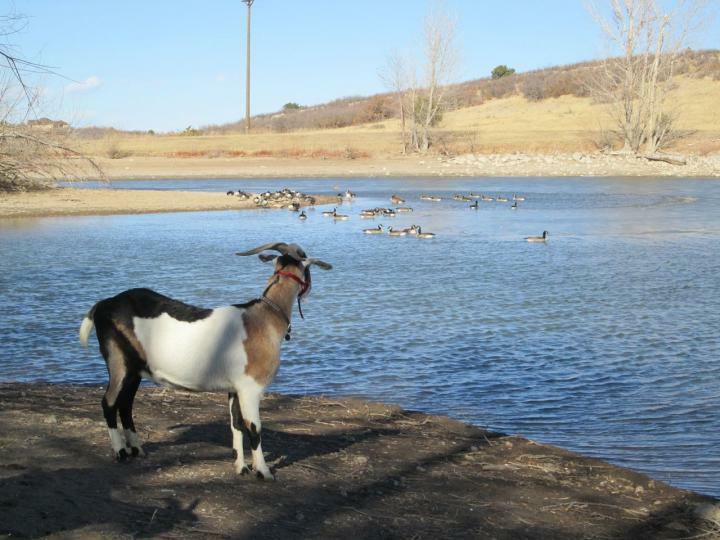 The goats were somewhat intrigued by the geese at first, but soon decided they were boring. The lake is very low right now. We could desperately use some snow. Normally the lake goes all the way up to the trees. The ice chips along this shoreline made some really cool sounds in the lapping waves. They tinkled like wind chimes. This ridiculously awkward photo was supposed to be cool, not embarrassing. But I’m posting it anyway because it’s funny. I was sending Sputnik over this creek and back and he was jumping magnificently with just a point from my finger. I wanted Phil to get a photo, but wasn’t sure he’d get the timing right if he didn’t know when Sputnik would jump. So I jumped first so Phil would know when to click. It somehow didn’t come out very well. It looks like Sputnik butted me right over the ditch! He also looks like he’s straddling it instead of jumping it, which I guess would be a more impressive feat actually. Well we had fun anyway. Sputnik has learned very well that when I point at an object he should jump on it. Phil and I both spent time working with our boys and had them jumping ditches, hopping on rocks, walking along the tops of stone walls, and jumping back and forth over guard rails and parking barriers. Sputnik did not want to jump over the three-foot parking barriers. The were higher than he wanted to jump and it was easier to go under or around. Treats weren’t convincing him, so our practice at driving came in handy. Sputnik has learned that if I tap his hindquarters it means “go forward”. 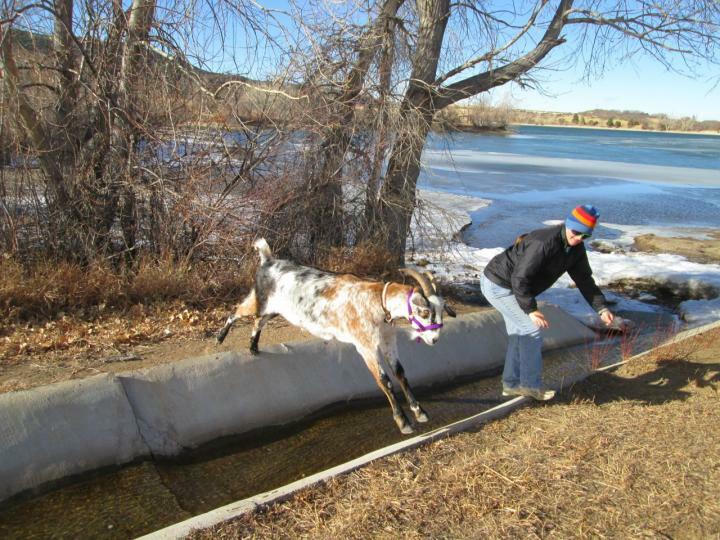 When Sputnik refused to jump the barrier, I swung the leash toward his hips and he went straight over without a fuss. He got his cookie and then jumping was suddenly fun! He got balky again when Phil took Finn back to the truck. That time I slapped Sputnik lightly with the leash handle and he immediately got the point. He quit looking at Finn, got his attention back on me, and jumped the barrier. He seemed very proud of himself for jumping without Finn there for moral support. Sometimes it takes a bit more work to make Sputnik do something he’d rather not try, but it’s always worth it in the end because he gets very excited and full of himself afterwards. When I push him to accomplish what I ask, his self-esteem goes through the roof! 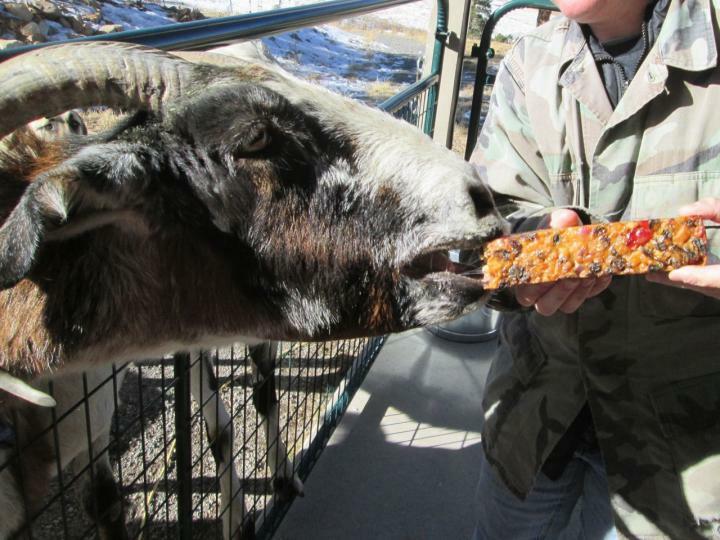 Today the goats got their annual fruitcake treat, and of course Cuzco got most of it. 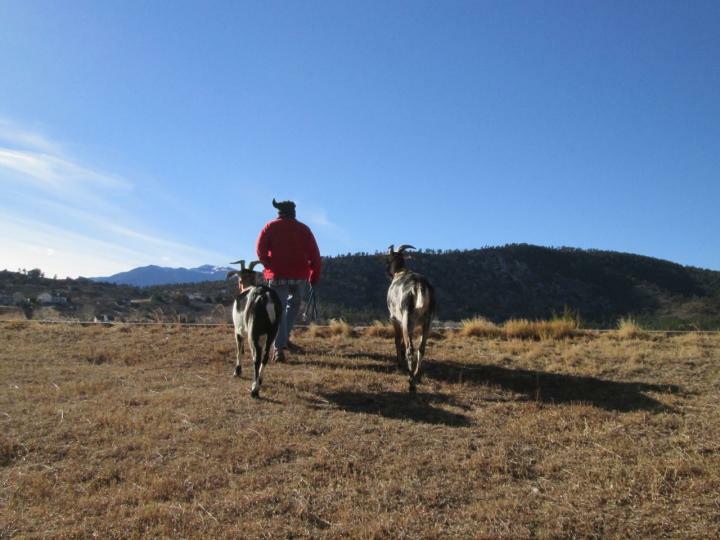 Only a few of the goats really like it, and since Cuzco really, REALLY likes it (and because he’s the biggest and the oldest), he insists that he should have ALL of it. However, we made him share a few small bites with Nubbin, Jezebel, and Finn. Nubbin and Jezebel ate it like candy, Finn was politely interested, and the rest of the goats weren’t convinced it was edible. So Cuzco happily gobbled down their portions. Finn and Sputnik got new Cuzco-sized halters for Christmas. They were outgrowing the old ones. Sputnik’s halter recently began riding so low on his big Roman nose that it was starting to slide off the end of his face. The new one rides comfortably above the bridge of his nose. Finn didn’t quite need a new halter yet, but since he will by spring, we got him one anyhow. 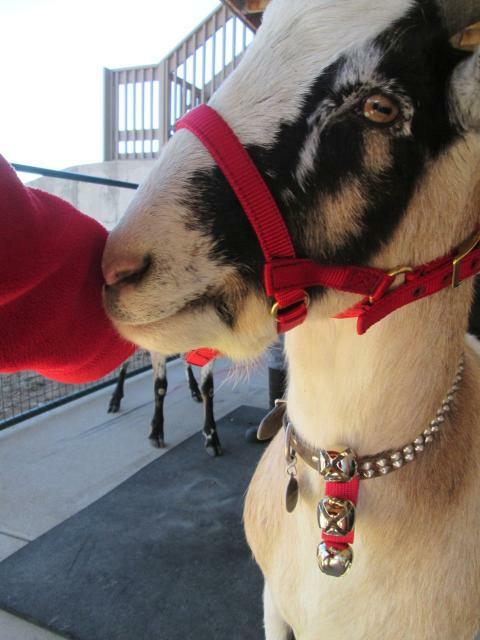 Both goats also got some nice little jingle bells in colors to match their halters. Sputnik has been very full of himself lately–challenging Finn, pounding the young bucklings, picking fights with the girls, etc. But today with the jingle bells on his collar he was extra frisky! Every time he reared on his hind legs, the jingle bells would jangle. 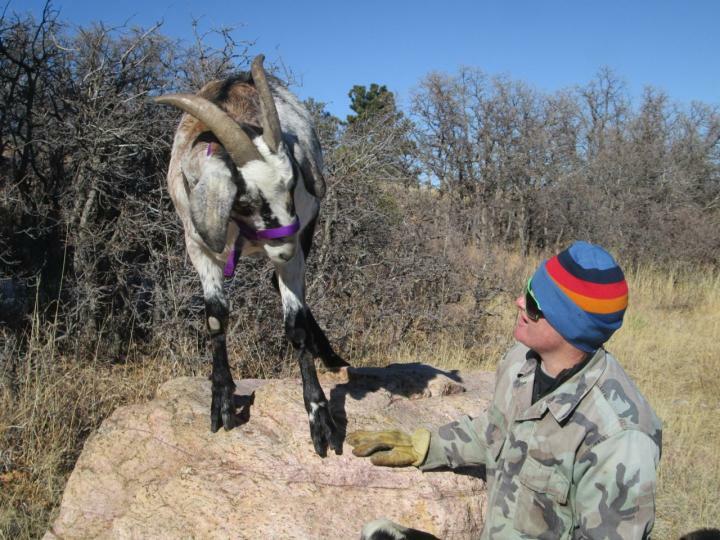 So he started hopping around all over the place and rearing up at every goat in the herd. Then he got in a fight with Finn too close to old Cuzco, and Cuzco made them stop. So Sputnik jumped on rocks for me instead. I taught him that when I say “Stool,” it means I want him to stand on whatever thing I’m pointing at. He’s been very enthusiastic lately and has started jumping on every rock along our walking route in hopes that I’ll give him treats for every one. He’s mistaken, but he sure is cute! Sputnik didn’t believe me when I told him there is no Santa Claus. We had a hellacious wind storm on Christmas Day. We went out for Christmas Dinner at a friend’s house and we were afraid we’d come home to find our house and all our goats blown away. Doing chores in 50 mph winds is no joke! I lost a load of hay and four buckets. Today Phil and I took the goats and wandered around our property picking up pieces of soffit, shingles, and insulation from our roof. I found two of my missing buckets lodged in the bushes. The big tub I used to carry hay had been whipped right out of my hands (with the load of hay in it) and I found pieces of it scattered across our pasture. The fourth bucket is probably in Kansas somewhere. We lost two trees. 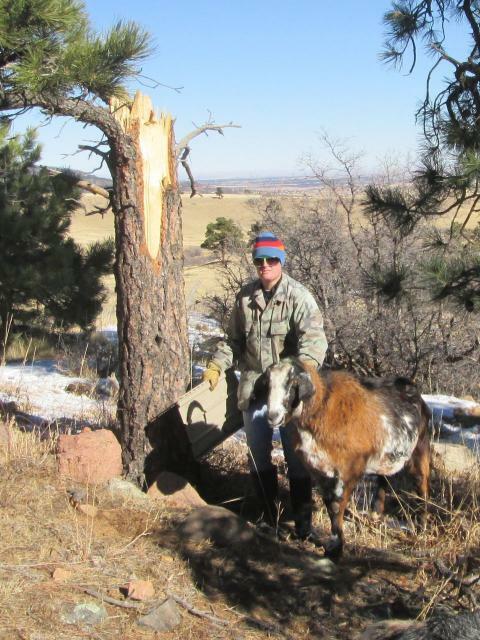 However, Cuzco would like everyone to think it was he who knocked this big tree over. That soffit in my hand was found clear on the other side of our property and a very long way from our house! I was sad to lose this big tree. The other one had pine beetle holes in it so we would have lost it in the next six months anyhow. But this one looked perfectly healthy until the wind took it. At least it was not next to our house, nor any goat pens, nor any power lines! The goats will be feasting on this for months! I won’t be able to cut it up for a long time because it’s so green. 2016 Beulah Parade and Yule Log Festival! 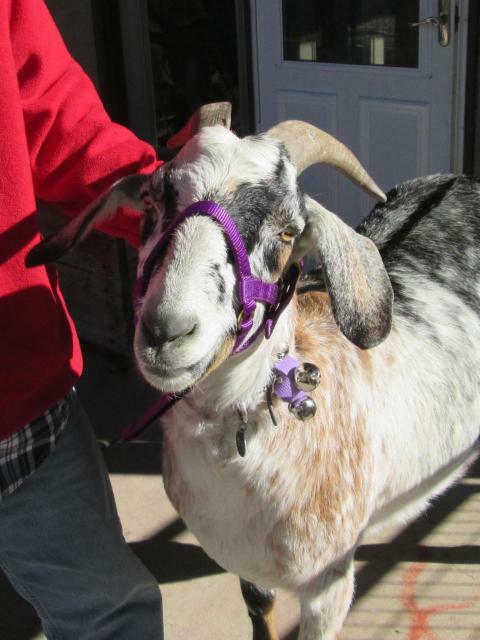 It has been an exciting weekend here at Goat-O-Rama! 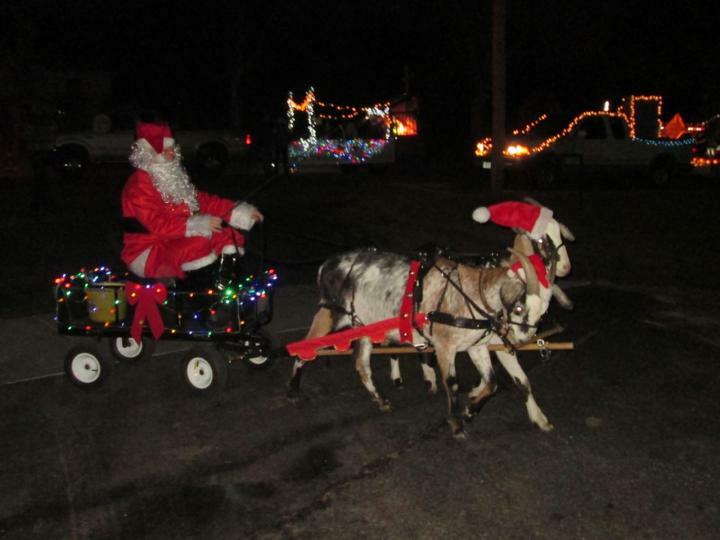 Last night was the annual Beulah Christmas parade of lights, and this year we took Finn and Sputnik instead of old Cuzco, who is probably not up for the long drive followed by a cart pull these days (although I have to say, the old fellow is doing remarkably well this winter!). The parade was interesting this year. 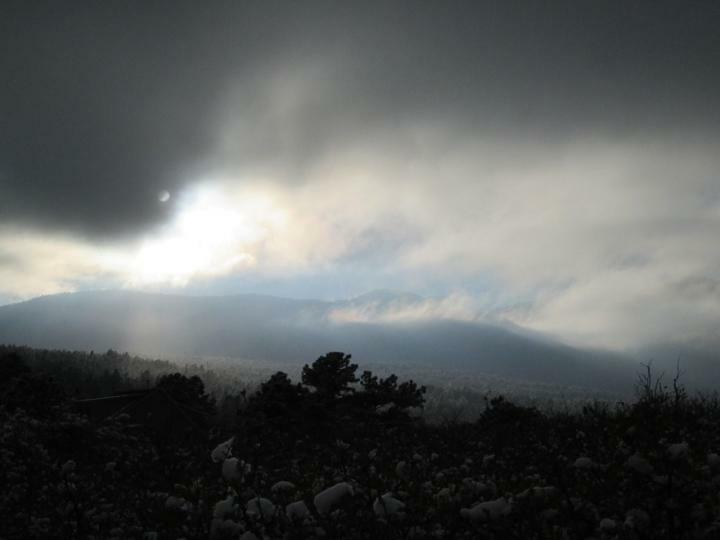 The weather was almost balmy–a stark contrast to the blinding blizzard and treacherous roads we battled last year. I got the boys harnessed and decorated while Phil put on his Santa suit. I dressed as an elf (no pictures of that unfortunately–or maybe fortunately, depending on your point of view). The boys were very fractious at first, and it was largely me and Phil’s fault. We’ve hardly taken them driving at all in the last three months so they are very out of practice. We kind of sprung this on them with only one drive earlier in the week. Phil was rusty at driving, the boys were rusty at pulling, and this was their first time to be driven out at night other than the Halloween event where I led them. I told Phil to trot them up and down alongside the parade lineup and let them see everything instead of standing around getting spooked and keyed up. 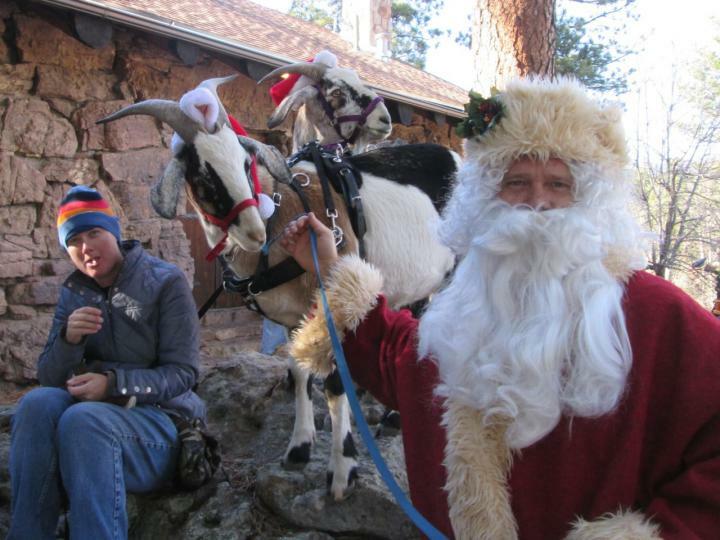 But Phil couldn’t hear a thing under the Santa beard and kept standing them in one spot, much to my chagrin. I couldn’t understand why he wouldn’t take them up and down like I said. I was about to do something about it when the fractious goats suddenly took matters into their own hooves and swung violently to the left, upsetting the wagon and dumping poor Santa onto the pavement in an undignified heap. It was embarrassing but not injurious. No goats or Clauses were hurt and the wagon was quickly set upright again. After that Phil kept the boys moving until the parade was ready to start. 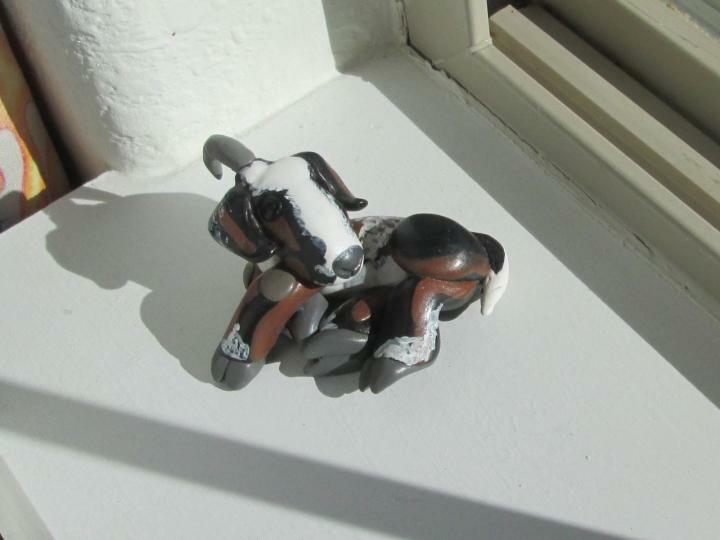 Moving helped them focus and they soon began to settle down and listen. We were told to get in line behind the fire trucks, which meant that we were the first “real” parade float. We started off and the boys went very well together while we followed the trucks. But soon those trucks began to pick up speed and we were jogging to try to keep up! It’s a good half-mile from the lineup area at the school to the main gathering area in the center of town. 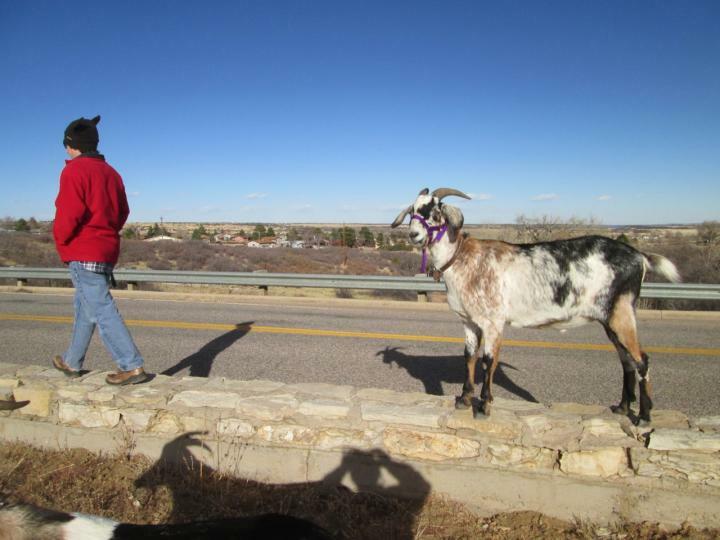 The streets were very dark on the way there and when the fire trucks disappeared in the distance, taking their lights with them, the goats became a bit hesitant about striking out alone and in front on the deserted road. I went on ahead of them and we jogged most of the way there but we never caught up to those trucks. 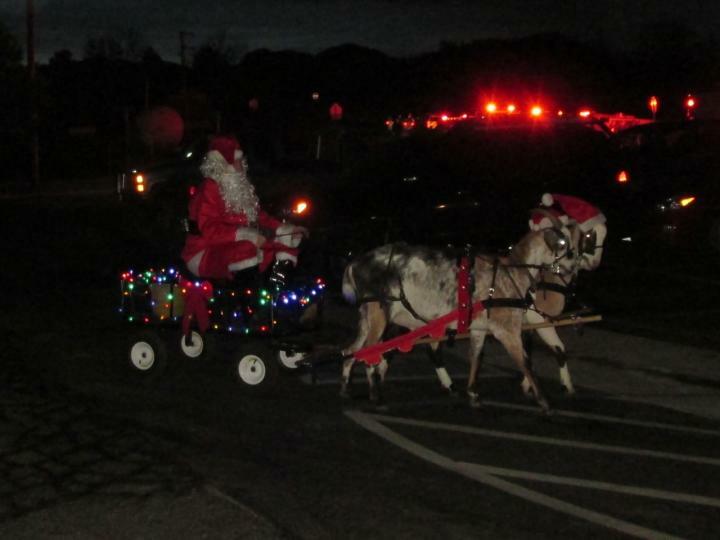 They acted like they were en route to a four-alarm fire, not leading a Christmas parade! So when we got to the town center we felt like we were heading up the whole shebang. 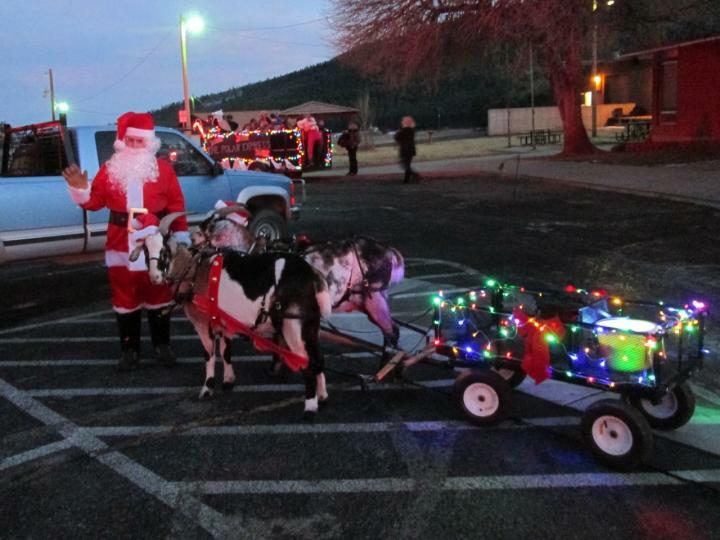 The goats went fine again once we were under the lights and I was able to walk behind the wagon and throw candy. The only time they truly balked was when we started to leave the lighted area and there were dogs on leashes barking at them from the dark. I went ahead of them to provide moral support and they went on just fine. We were all pretty tired when we got back to the truck. We’d jogged along much of the parade route trying to keep up with those crazy fire trucks, and the town of Beulah has a lot of hills in it–some of them rather steep. The boys pulled their wagon up and down quite admirably and Santa never had to disembark. Next time there’s an event, though, we’re going to make sure and get in some practice beforehand. It wasn’t fair to spring this on the boys without preparation even though they did rise to the occasion. We were back in Beulah again this afternoon for the wonderful annual Yule Log festival, which is easily the highlight of our Christmas season. The goats are apparently a highlight for the folks organizing the festival as well, since we are now regularly invited to attend. The first thing we did after we arrived was to entertain some children and greet Father Christmas. We sat outside the lodge and listened to the muted sound of Christmas carols coming from the hall while two little boys ran back and forth collecting pine boughs which the goats gobbled down to the kids’ endless delight. 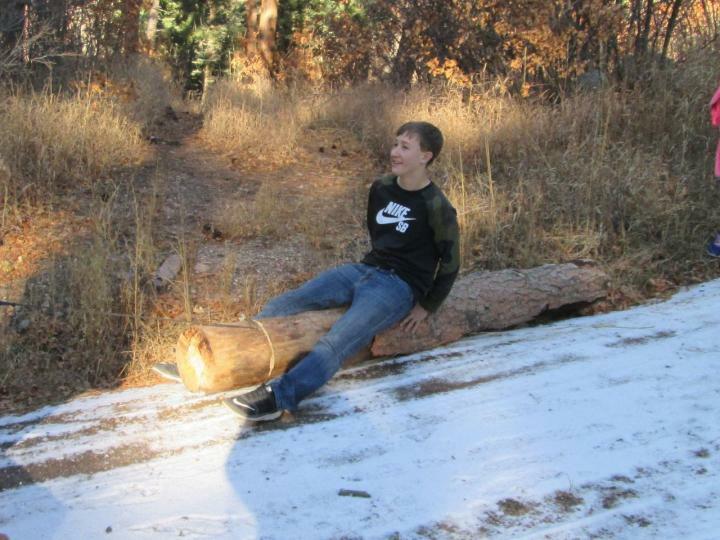 After the singing and Yule ceremony it was time to hunt the log! When everyone scattered toward the woods, Finn and Spunik took off with all the enthusiasm of a couple of tornadoes. Sputnik acted like he wanted to pull my arms out even though we were already running. 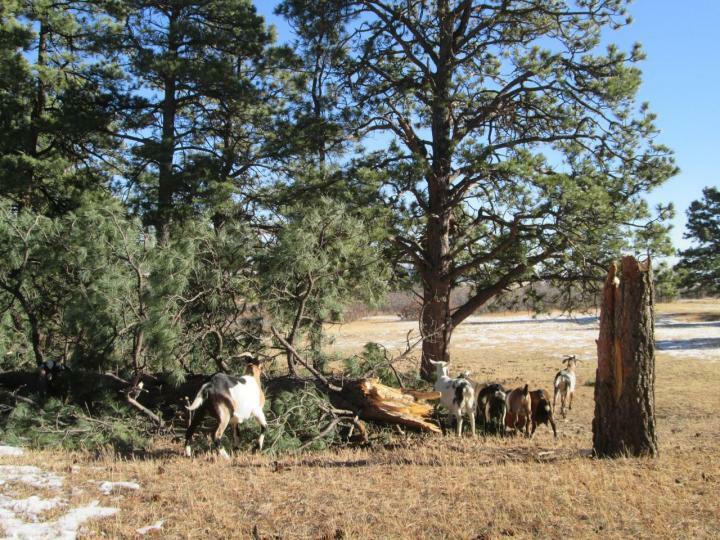 Those goats were determined to be the first to sniff out that Yule Log! I’m sure they heard about our plans to have them help pull it back and they wanted to thwart us by finding the log first. 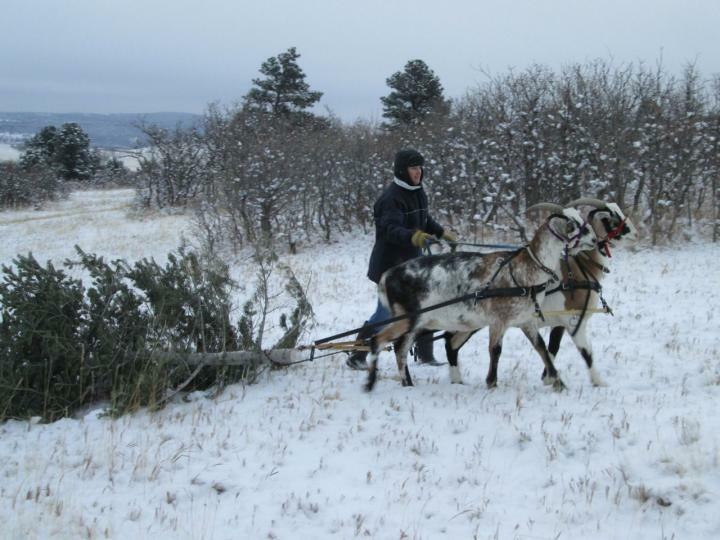 Because the first one to discover the Yule Log gets to ride it back to the lodge! Unfortunately, all the enthusiasm in the world can’t guarantee success. We were far from the Yule Log when we heard the distant cry of “Haleub!” (Beulah said backwards), to announce the discovery. We made our way across the ravine and the lucky finder mounted the log (along with all of his friends) and the rest of us got to man the ropes. 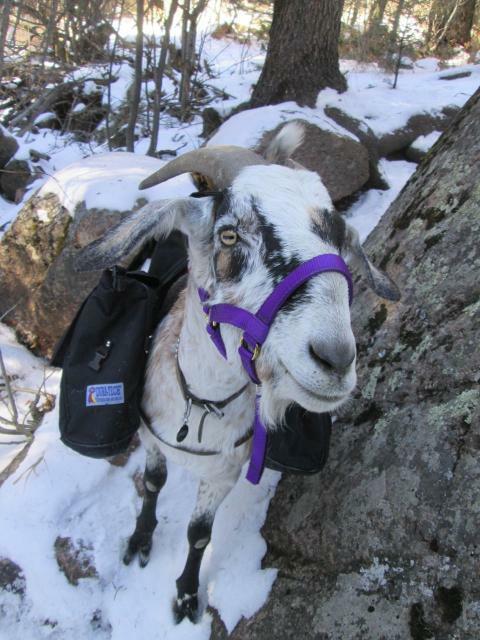 Since our goats were finally big enough to do their fair share of hauling this year, I had put on their harness breastcollars beforehand so we’d be prepared. I modified a couple of things so they could pull without the traces. Then Phil and I tied them into the pulling ropes and let them do their thing. And boy did they do it! 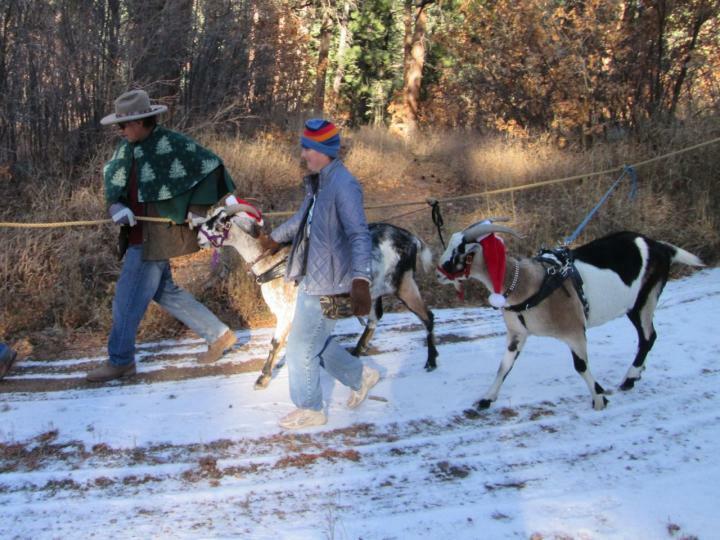 Finn and especially Sputnik leaned their bodies into those harnesses and hauled away for the whole long trip back to the lodge. They do love to pull! That’s how the song will be sung in the Hassey Household from this day forth! After an unseasonably warm December, we finally had some snow on the ground to make the atmosphere feel seasonably festive enough to cut our tree. 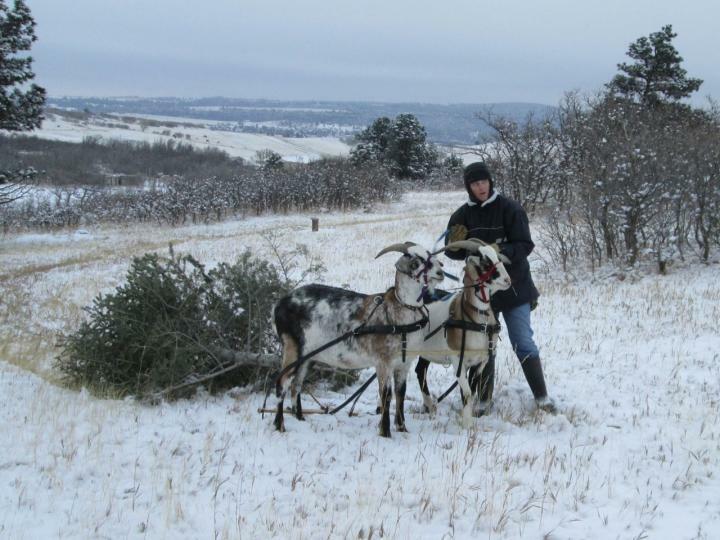 I usually bring a horse to haul our tree home, but I spent a lot of time this year training team of goats to pull, and by golly it was time they did more than follow the tree home while stripping it bare! The day was beautiful but bitterly cold! 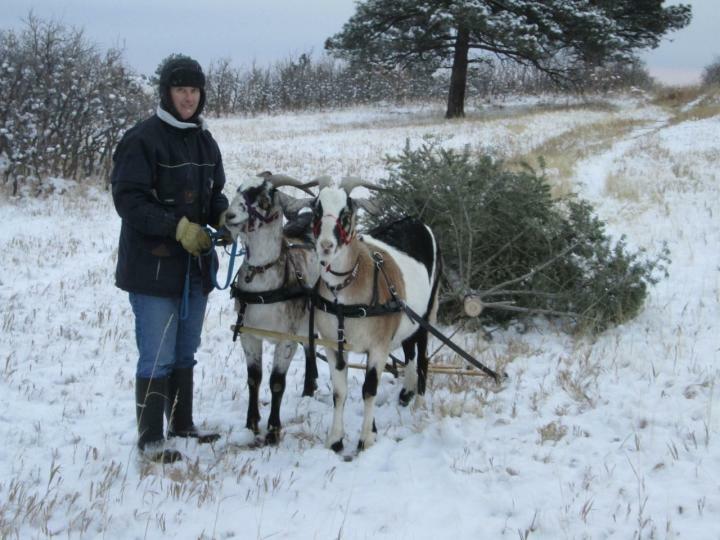 Our “Christmas tree lot” grows on a very steep ridge behind our house and is almost impassable because of the thick scrub oak, but I’ve cut a few paths so we can access the stands of fir trees that grow there in abundance. 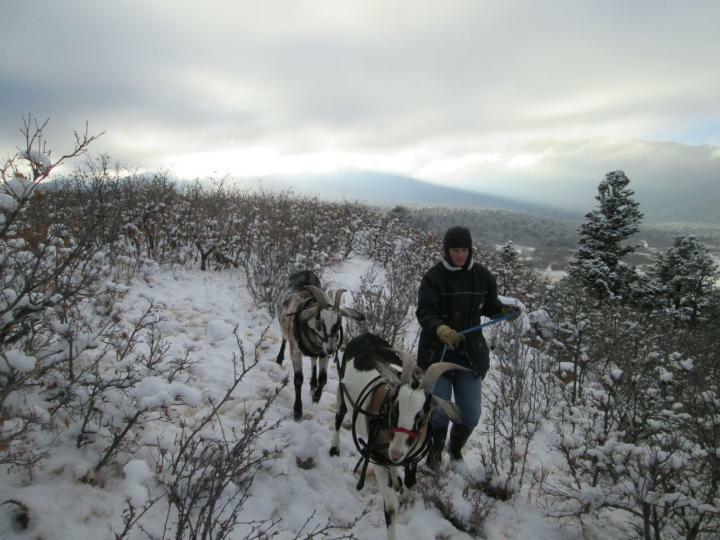 Finn and Sputnik were not particularly happy to be out there with us. It was late afternoon and high time for supper in their opinion. The other goats were all snuggled down in their sheds. But I put leashes on the boys so they had to come. Unfortunately the goats had other ideas. Finn was in a rip-roaring bad mood. He wasn’t happy about being dragged into the wilderness and forced to stand next to Sputnik. He kept snapping viciously at Sputnik’s ears, and Sputnik kept trying to run away from him. Finn was not happy about being made to stand in the cold snow and wait for us to hitch him to a tree. He was convinced that the other goats must be having dinner by now (never mind that I wasn’t there to feed them, but goats don’t seem to think very logically about these things). 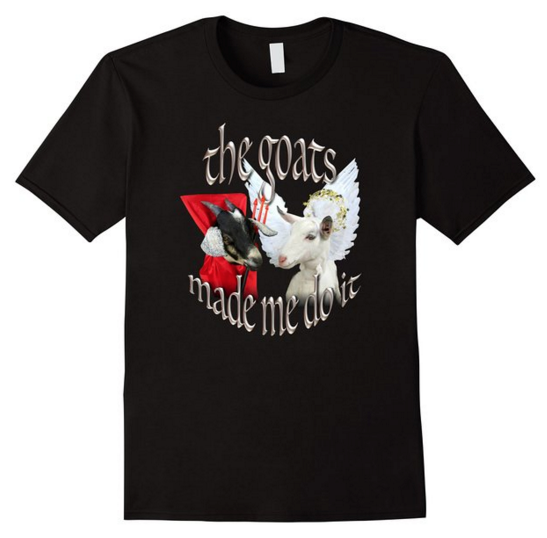 We got the goats hitched without too much trouble other than Finn trying to tear Sputnik’s ears off, so I thought the rest would be easy. All I had to do was lead them home. Finn, however, had no intention of following sedately behind me. 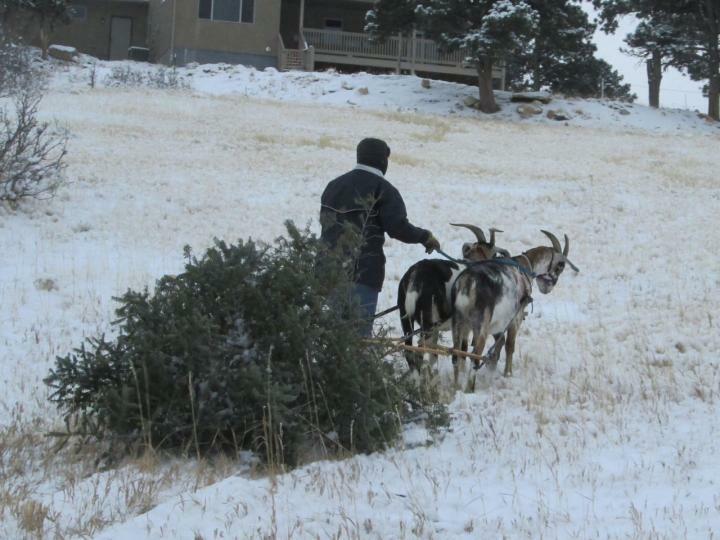 He wanted to run home even if it meant dragging the tree and Sputnik all by himself! 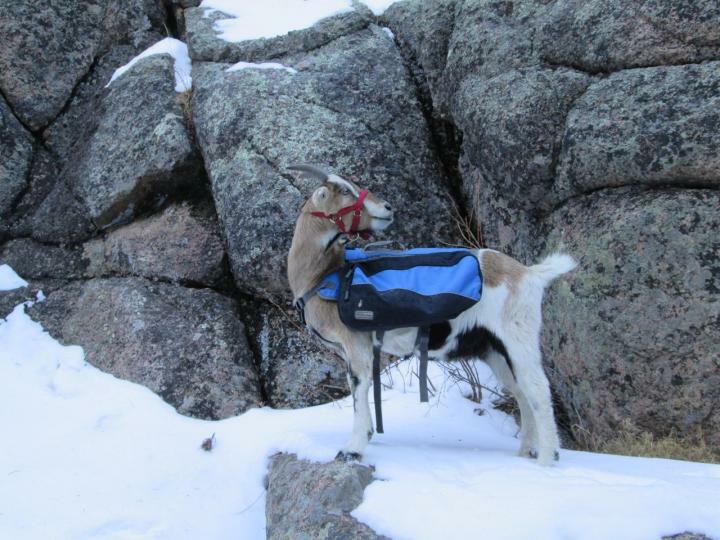 For a brief moment I made the mistake of holding Finn’s leash between my knees while I rigged up a rein from Finn’s halter to Sputnik’s harness–an attempt to keep the goats somewhat even and force Finn to slow down. Finn saw his opportunity and made a break. Sputnik went with him. We were on a narrow path lined with oak brush. I had nowhere to go and no time to move anyway. That tree barreled over me like a freight train and all I saw was a rooster tail of snow shooting behind our tree and two wildly bobbing tails retreating gleefully into the distance. That tree was ten feet tall and heavy, but you’d think it weighed no more than a pillow the way those goats were running with it! My cries of “Whoa Finn! Whoa Sputnik!” went completely unheeded. Luckily Phil had gone ahead of us with the camera and was able to head them off. I got control of the lead rope and we somehow managed to make it home with the tree intact. We even got a few decent photos! But I don’t believe our Christmas card is very honest about what really went on this afternoon. 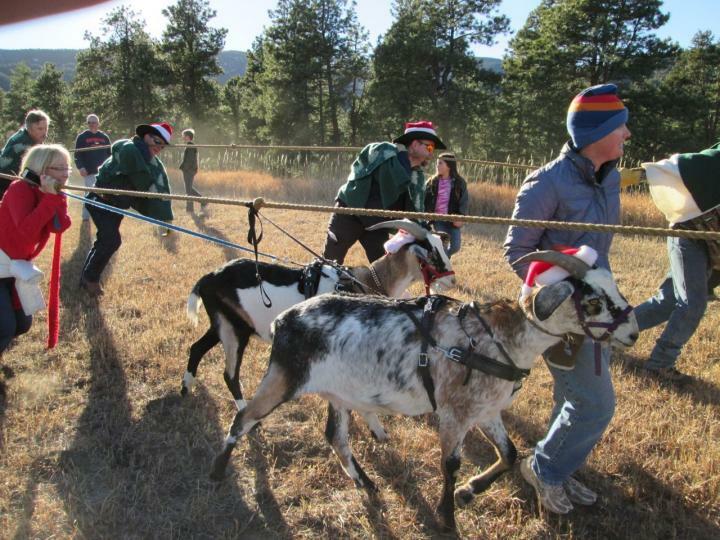 Unfortunately, the most exciting moments could not be captured on film as the photographer was too busy wrangling our wild, runaway goats!